Huge Savings Item! Save 14% on the Ventura Economical Bolt-On Bicycle Carrier Rack, Adjustable Fit for 26''/28''/700c, Steel by Ventura at Idaho Velo Park. MPN: 440149. Hurry! Limited time offer. Offer valid only while supplies last. 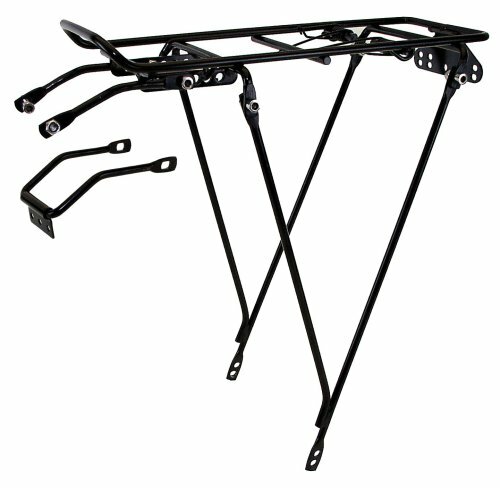 [SPECIFICATIONS] lightweight, steel rack mounts to the back of your bicycle to help transport bags, panniers, cargo baskets and more at a 40 lb. weight limit - a reflector bracket and spring flap are also included! [INSTALLATION] An updated assembly guide is available, please see product photos and the bottom of this listing page!